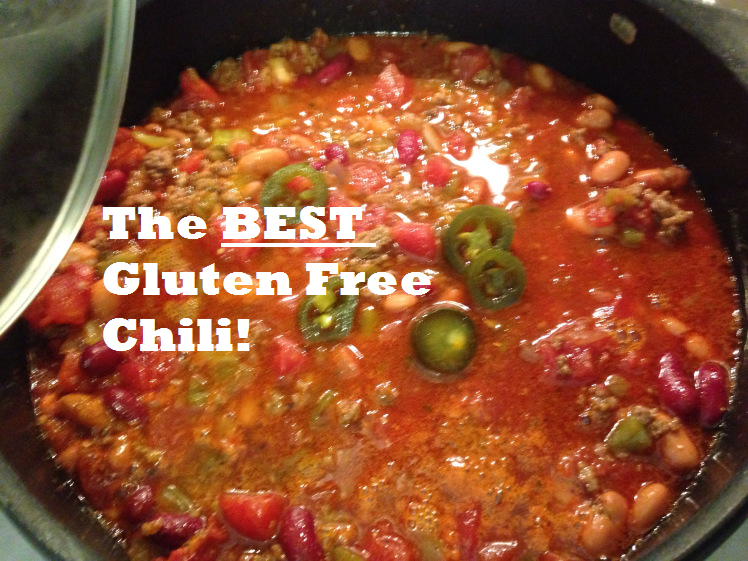 The BEST Gluten Free Chili! Sunday afternoon I made some delicious gluten free chili! I make this recipe often once it gets cooler outside. It’s healthy, filling, and amazingly delicious! Sunday afternoon I mixed up the chili, and let it cook low and slow for 2 hours. Not only does it make the house smell wonderful, but it’s the perfect food for football! I created this recipe last year by combining some of my favorite components from my friends chili recipe and some cooking tips from Pioneer Woman. It has a few special ingredients that really make it stand out: green chilies, picked jalapenos, corn meal, and gluten free beer. I promise if you make this for your family or friends, they will be super impressed! I used kidney beans, pinto beans, green chilies, diced tomatoes, Rotel, a big garlic clove, and a medium onion for the bulk of the chili. Using a small amount of olive oil, I sauteed the chopped onion over medium heat until it was starting to caramelize. Then I added 1 pound of lean (93% fat free) ground beef, and cooked it until brown. While the meat is cooking, I mixed up some spices. I created my own Chili seasoning instead of using a packet, which often contains gluten or really high sodium. I combined chili powder, cumin, onion powder, garlic powder, oregano, salt, and pepper. Then I tossed this and my minced garlic clove in with the cooked beef. * I drained any fat from the cooked beef before adding the spices. Then I dumped in the tomatoes, Rotel, diced green chilies, and two tablespoons of diced pickled jalapenos. I topped it off with my drained beans and stirred to combine. Then I opened two beers (one was for me!). I really like the Omission lager. It uses traditional gluten beer ingredients, but they use a process to remove the gluten proteins to a safe level. This gives the chili a real beer taste! Pour the beer all over your chili, stir, and then let it cook on low for about an hour and a half, giving it a stir occasionally. To thicken the chili, I used two tablespoons of cornmeal mixed with a little bit of water. It gives the chili great flavor and helps give it a bit more body. I let it cook another 30 minutes, but really the longer, the better for flavor. I served it with quinoa, 2% cheddar cheese, and low fat sour cream. The sour cream works really well to balance the spice level of the chili. I also whipped up a batch of gluten free cheddar corn bread to go along with it! Recipe for that to come next! Ashley’s Chili Seasoning (1 tablespoon chili powder, 2 teaspoons cumin, 1 tablespoon season salt, 1/2 teaspoon garlic powder, 1/2 teaspoon onion powder, 1/2 teaspoon ancho chili powder. Grated 2% cheddar cheese, low fat sour cream, red onion, avocado, quinoa or other toppings as desired. Add olive oil and onion to the pot and let it cook for several minutes until the onion started to slightly brown. Add in the ground beef and cook until browned, then drain any fat. To the beef, add the garlic and spices and stir until combined. Add in the tomatoes, Rotel, diced green chilis, drained beans, and picked jalapenos to the pot. Give everything a big stir. Now add in your beer, stir the mixture one more time, and then cover and cook on low for an hour and a half. Once the chili has cooked for an hour and a half, mix two tablespoons of cornmeal with a little bit of water until a paste forms. Then stir this mixture into the chili. Allow it to cook for at least another 30 minutes. The longer it cooks, the better! Remove the pot from the heat to slightly cool while you prepare any sides. Pile into a big bowl, top with your favorite toppings, and enjoy! You could definitely omit the beer and substitute another liquid if you prefer. This could also be made in a slow cooker while you are at work! It is so easy!